Functional unit of liver consists of lobules. Each hepatic lobule has cells radiating centrifugally from a central vein. The periphery of the lobule shows branches of hepatic artery, portal vein and bile duct. These three structures form the portal triad. There are large sinusoids present between the cells, which contain blood from portal vein and hepatic artery. The sinusoids drain blood into the hepatic vein. The endothelial cells lining the sinusoids have Kupffer’s cells and tissue macrophages. Biliary canaliculi are present between adjacent layers of cells. They collect bile and drain into the bile duct. Each lobe of liver is drained by one hepatic duct. The right and left hepatic ducts join together to form the common hepatic duct. It joins with the cystic duct from gallbladder and forms the common bile duct. This opens at the second part of duodenum, together with the pancreatic duct (ampulla of Vater). The opening at the second part of duodenum is guarded by the sphincter of Oddi. 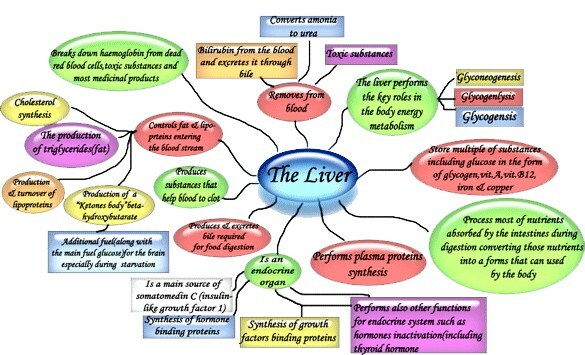 Liver has many functions which include metabolic, synthetic, storage, excretory, and detoxification. Carbohydrate metabolism Liver helps in glucose homeostasis. It shows glycogenesis, gluconeogenesis and glycogenolysis. It is the site for the conversion of galactose to glucose and fructose to glucose. Protein metabolism The formation of urea from ammonia, deamination and transamination reactions take place in the liver. Fat metabolism Lipogenesis, lipolysis, β oxidation of fatty acids, synthesis of lipoproteins, synthesis and esterification of cholesterol, formation of bile acids from cholesterol, ketogenesis, take place in the liver. The hemolytic jaundice is caused by increased destruction of red cells, arising from intrinsic and extrinsic defects in RBCs. Hepatic jaundice occurs, due to hepatitis caused by virus. There are several forms of this type, i.e. Hepatitis A, B, C, etc. Obstructive type is caused by gallstones in the bile ducts and tumors of biliary tree.